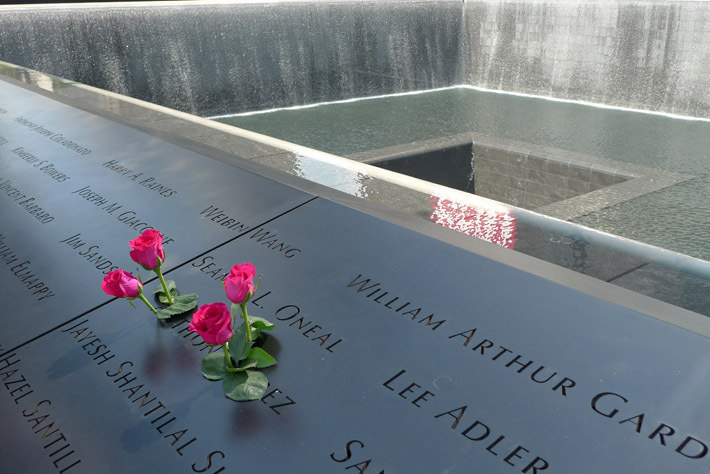 The Memorial commemorates the victims of the attacks of September 11, 2001, at the World Trade Center, Shanksville, Pennsylvania, and the Pentagon as well as the World Trade Center attack of February 26, 1993. 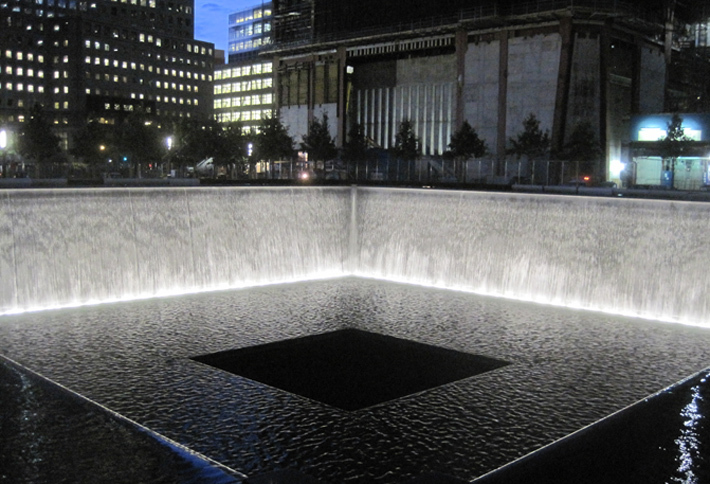 Using a language similar to Michael Heizer's North, East, South, West, the voids render absence visible. 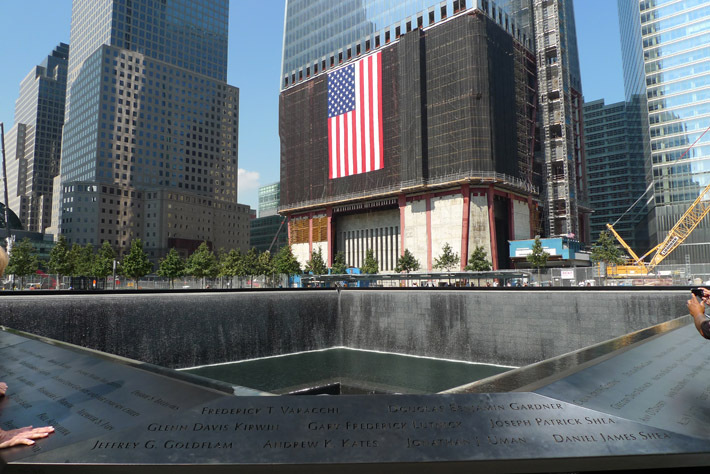 In this way, the overwhelming losses of September 11th are given permanent presence. Within the protected space of the forest, visitors will arrive at the two great voids with their thundering waterfalls. 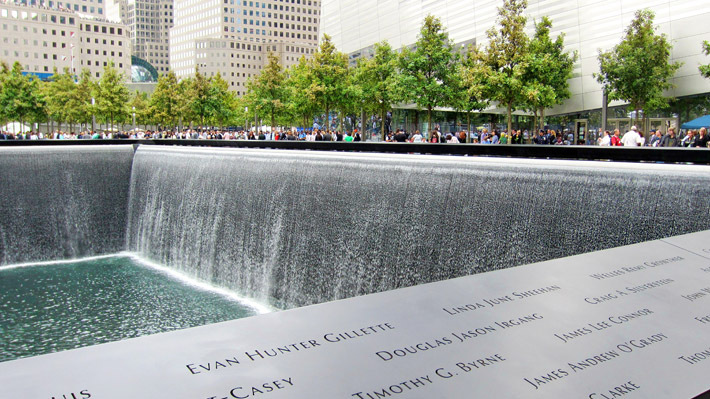 After viewing the victims' names on the bronze parapets of the voids, visitors will move back to the city through the trees and take comfort from the soothing, life-affirming forest. 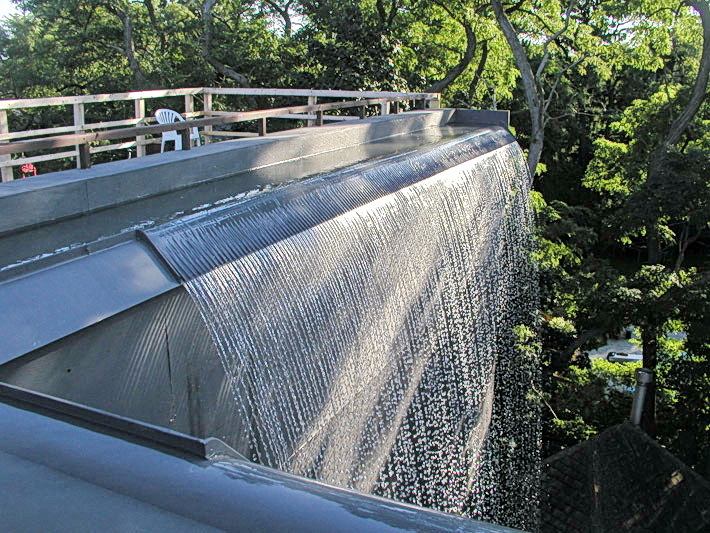 The one-acre voids, cut 30 feet into the site, are lined with waterfalls designed by Dan Euser With the addition of lighting designed by Paul Marantz, the waterfalls are also visible at night. 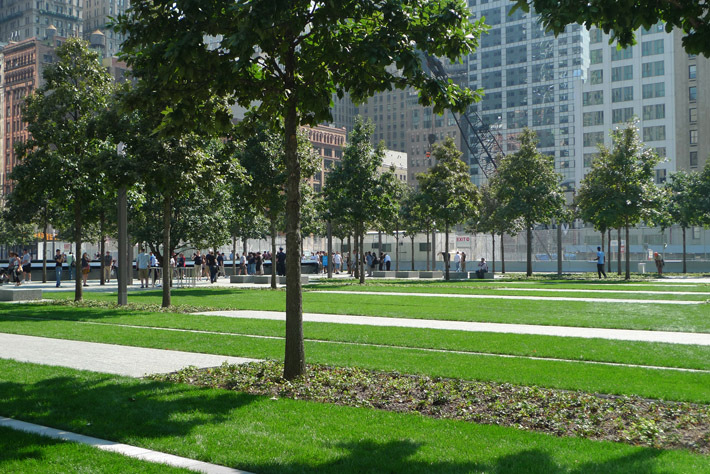 The Memorial grove resembles a “natural” forest, until visitors discover that the trees align to form arching corridors in one orientation. 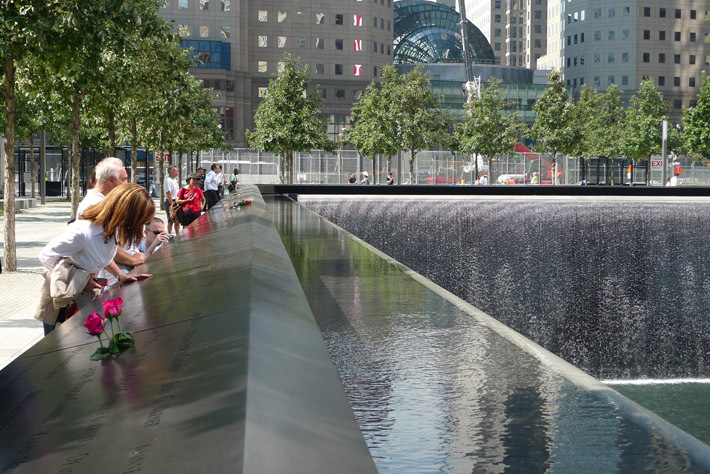 The form recalls the arches that architect Minoru Yamasaki placed at the bottom of the original towers. In this way, the grove expresses the shared patterns of nature and humanity. 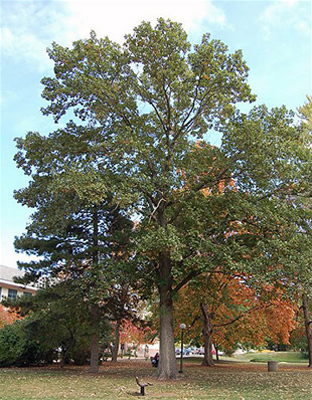 Working in collaboration with arborist Paul Cowie, PWP selected swamp white oaks as the tree species for the Memorial. Considered more disease resistant than red or pin oaks, the swamp white provides the strength, longevity, and symbolic weight that PWP was seeking for the Memorial. 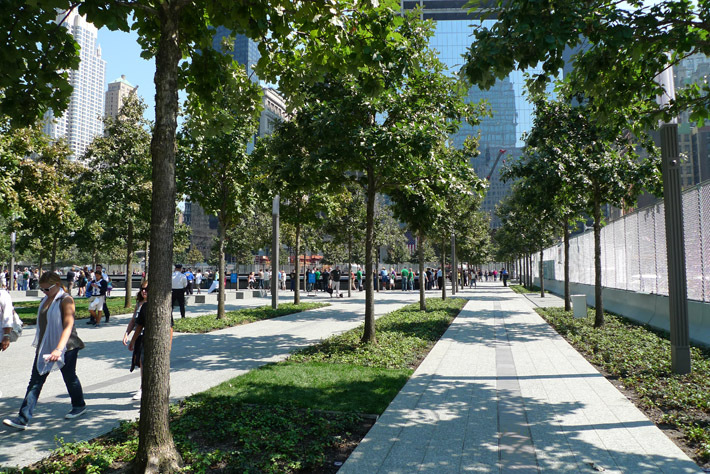 PWP developed a tightly-controlled specification for advanced tree procurement and maintenance and selected each specimen for consistency in size and form, seeking straight-trunked oaks that would form sturdy columns when planted at the Memorial. 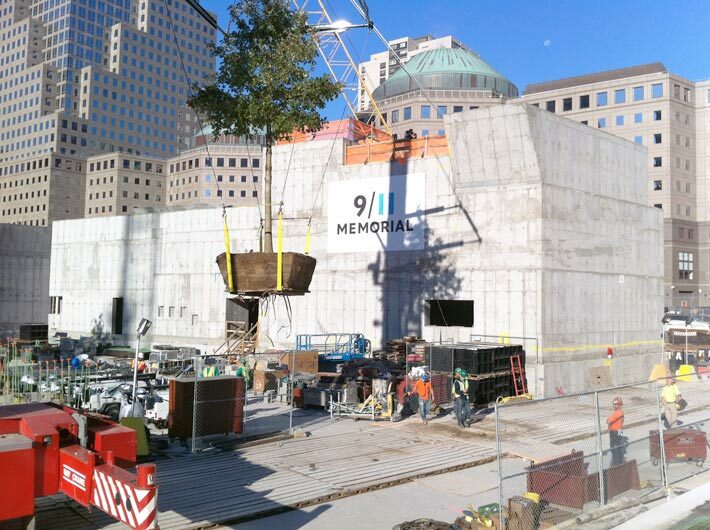 To maximize transplant recovery time the trees were transplanted into boxes several years ahead of construction. 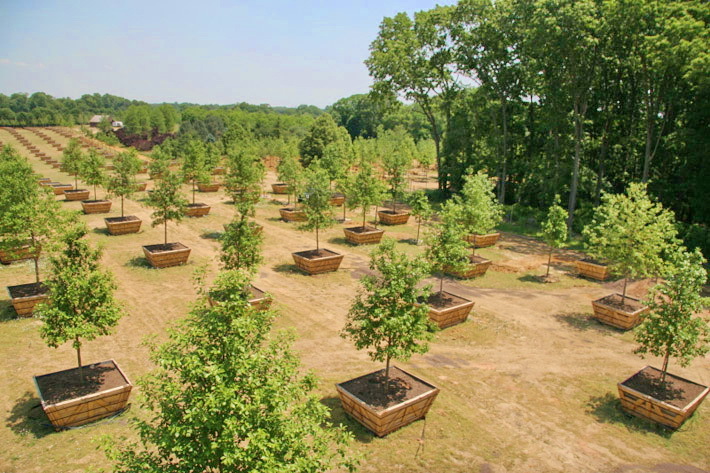 The trees were transported by Environmental Design to a temporary nursery in New Jersey where they have acclimated to the local climate for several years. Here, Bartlett Tree Service pruned, irrigated, and fertilized the trees to generate a canopy consistent in form and height. Since the trees were grown in over-sized boxes at a nearby location, tree transport and installation had virtually no impact on the root system. 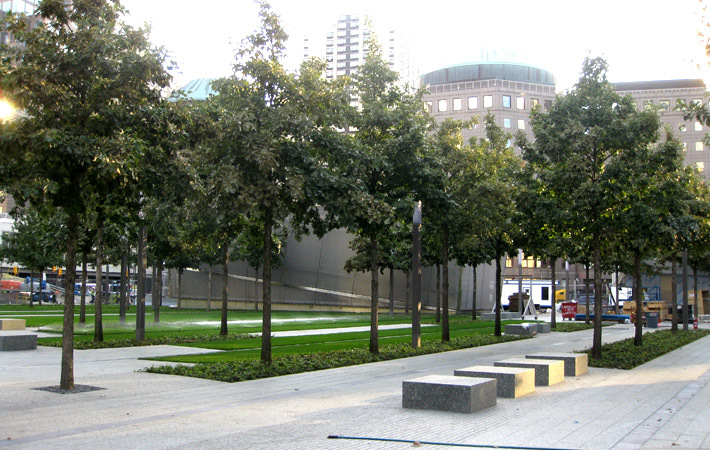 The trees were simply craned onto a flatbed truck, driven into the city, and craned into planting pits within the plaza. 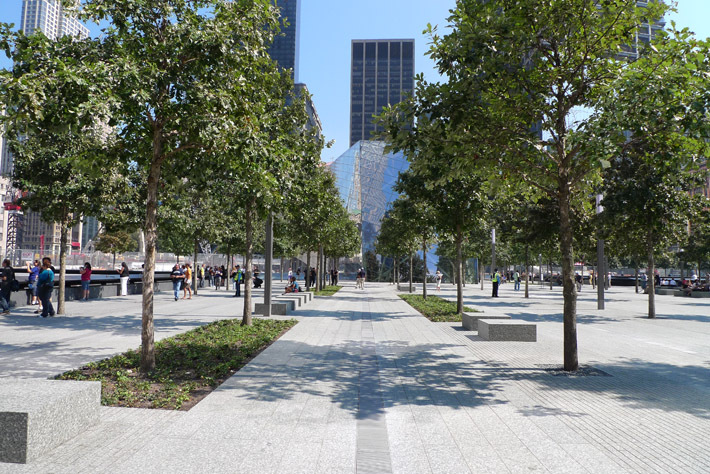 In contrast to the typical 'ball and burlap' tree-transplant process, which is limited to tight windows of time in the spring and fall, the Memorial trees were installed in batches through the seasons, in pace with plaza construction. The PWP design process involves studying projects in a variety of scales and media. 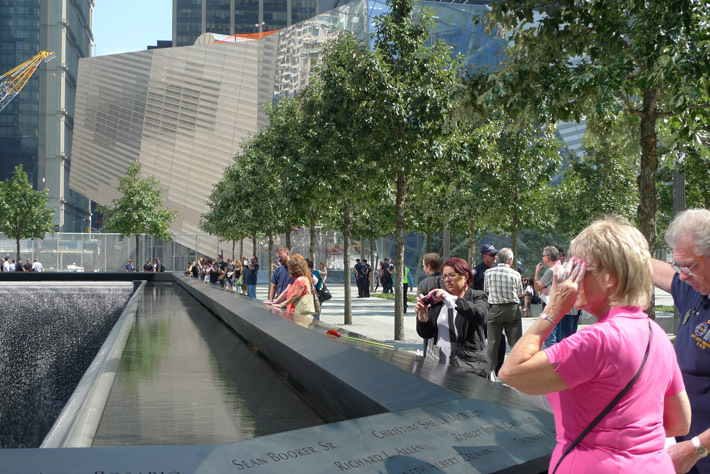 For the Memorial, large models were integral to establishing the scale, alignments, and relationships within the plaza. These models were also used to describe the project to stakeholders, political leaders, and the press. 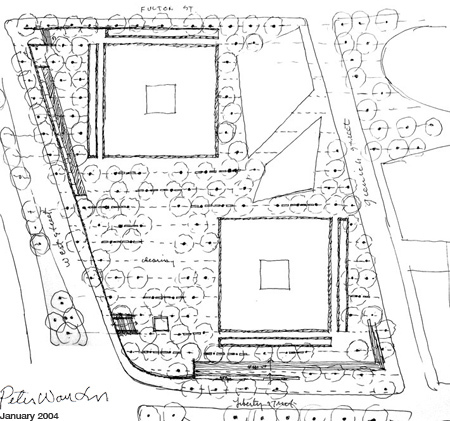 Full-scale mock-ups of each plaza component were integral to understanding details and proportions. 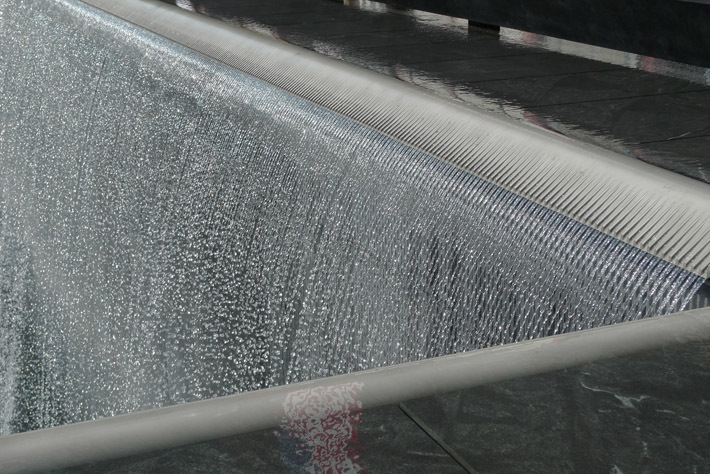 Using full-scale mock-ups to study the performance of the water, Dan Euser developed a tapered, rounded weir that is both water-and-energy efficient as well as highly visible and beautiful. The plaza is built of relatively few elements and materials. A single pole, for instance, incorporates lighting and security. 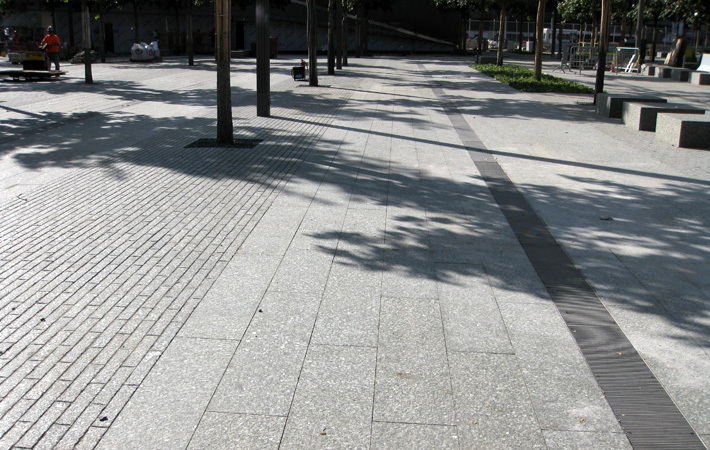 One type of granite is used for cobblestones, pavers, and benches. Planted ground coverings are limited to evergreen English ivies and turf grass. 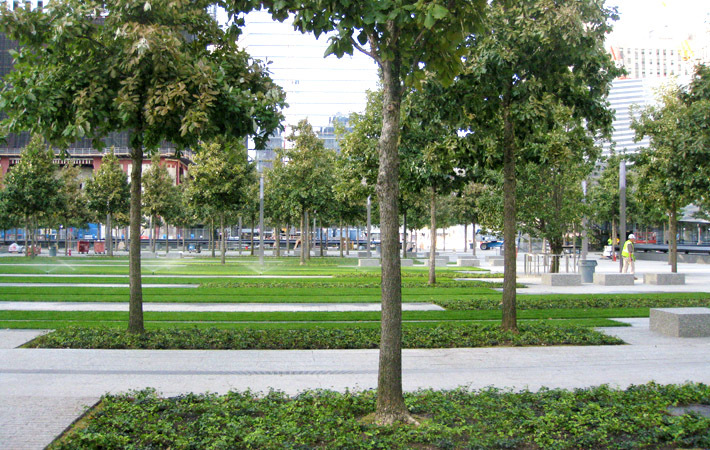 A single tree species is repeated throughout the Memorial grove. 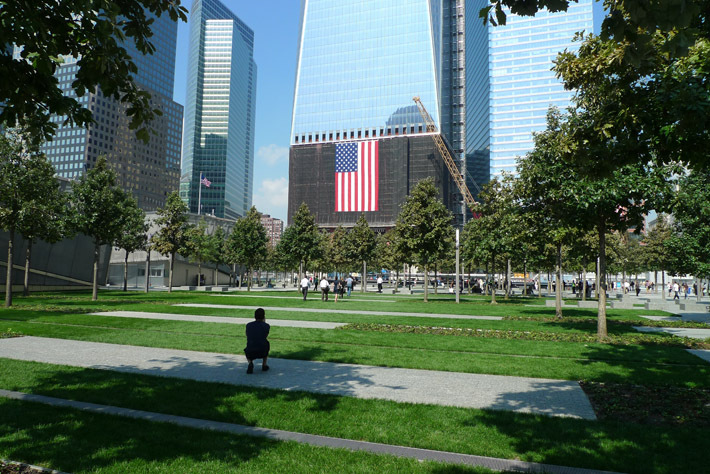 The limited palette is critical to the notable quietness of the plaza. PWP conducted wide searches and brought great care to the selection of each material. 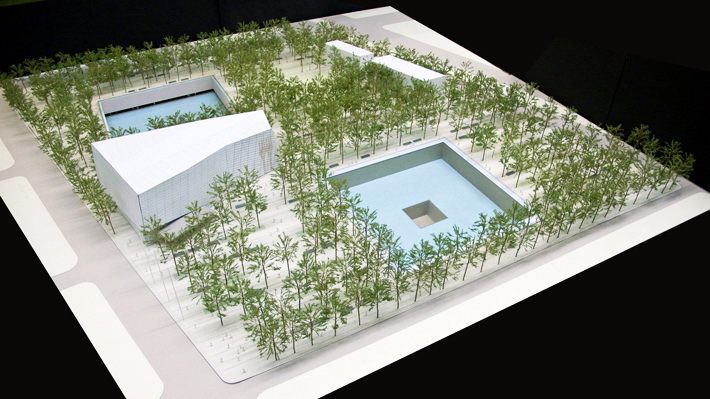 Despite its apparent simplicity, the Memorial is a massive green roof—a fully constructed ecology—that operates on top of multiple structures including the PATH station and tracks, the Memorial Museum, a central chiller plant, parking, and additional infrastructure. Together with Davis Brody Bond, the associate architect for the project, PWP coordinated with multiple agencies and stakeholders to establish a consistent visitor experience that extends over multiple structures and through several jurisdictions. 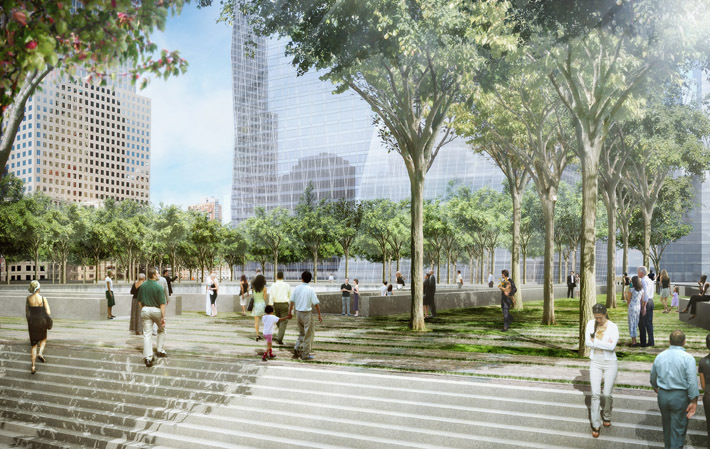 Throughout the design and construction process, sustainability of the plaza was considered in terms of both material endurance and landscape performance. 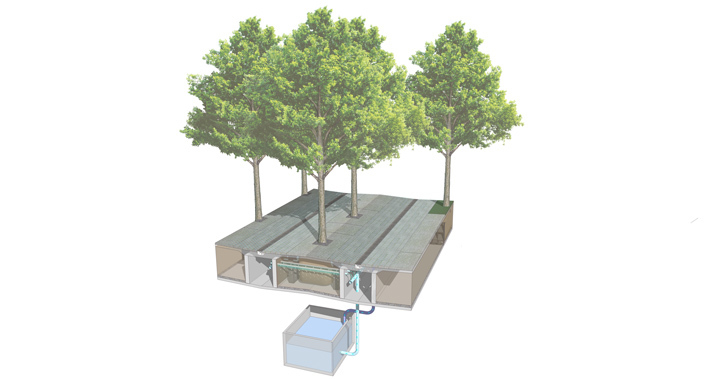 The plaza surface-and-drainage infrastructure is designed to function as a large self-sustaining cistern. Water from rainfall and snow melt is channeled into large holding tanks, treated and stored and re-used to support the Memorial forest via a specialized drip-and-spray irrigation system. 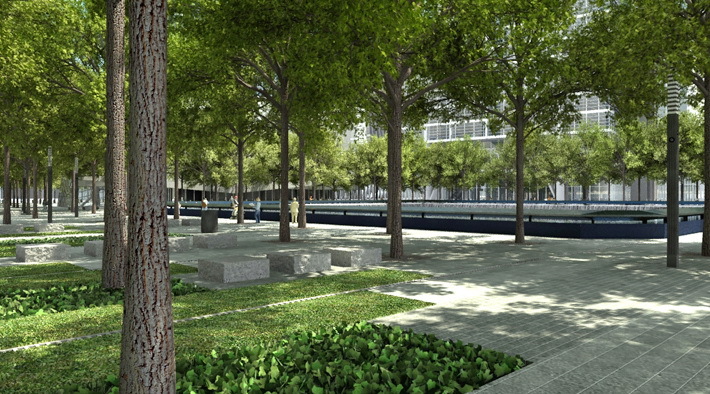 The Memorial grove is a dense planting of trees--a forest at the heart of the redeveloped World Trade Center. 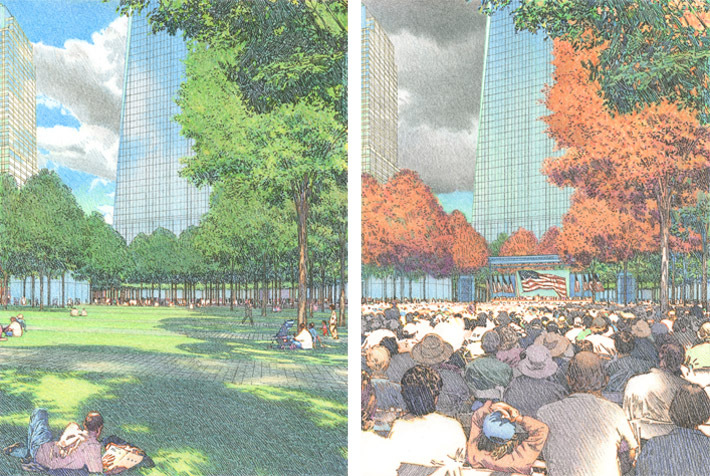 As they grow the trees will provide shaded space to increase comfort for visitors and reduce heat absorption on the plaza. The transpiration of the many leaves will cool the air throughout the district. The plaza is designed with a network of maintenance tunnels that provide access to site systems--irrigation, electrical, drainage. 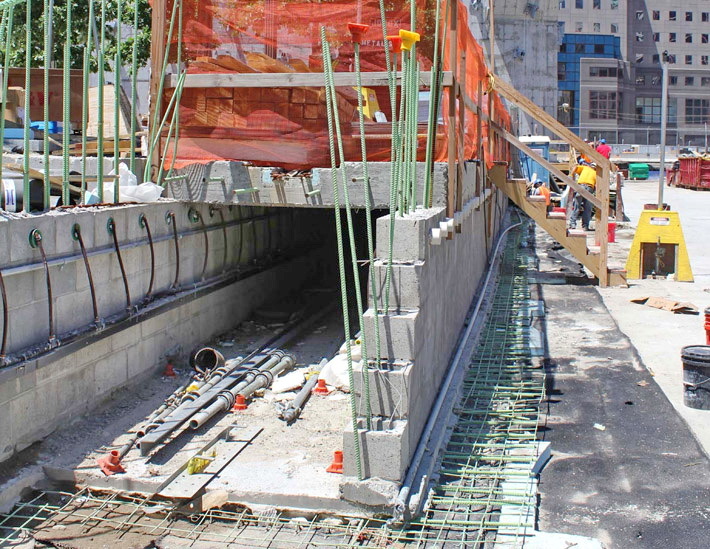 These tunnels will extend the life of the plaza by allowing maintenance crews to access, test, adjust, and repair systems with ease. 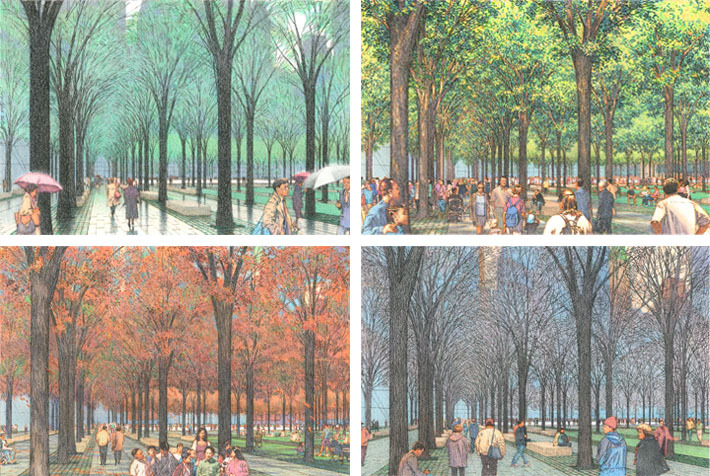 Substantial soil volumes, adequately irrigated, aerated, and drained, are the most critical element in the long-term success of the Memorial grove. An enormous volume of soil--40,000 tons in total—lies buried beneath the plaza to ensure that the oaks will grow and thrive to maturity. Advanced infrastructure planning was necessary to fit together all the buildings and streets in the district. 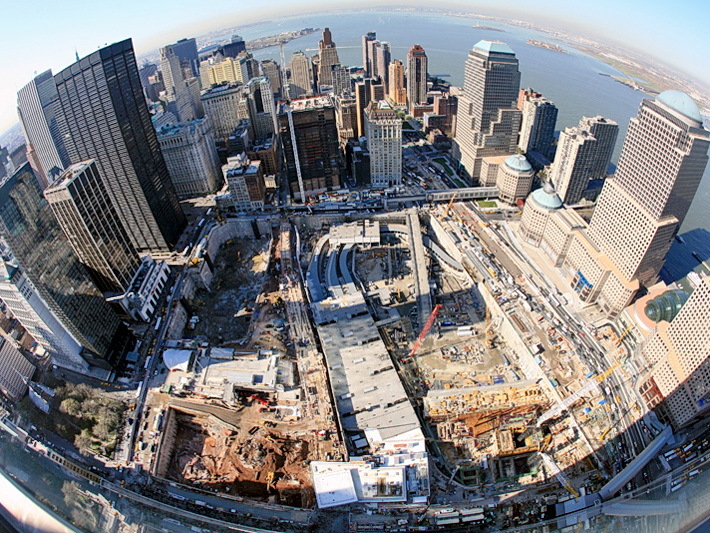 In 2008, with towers 2, 3, and 4 in advanced stages of design—and well in advance of the establishment of the Port Authority's streets-and-sidewalks engineering team—Silverstein Properties commissioned PWP to establish a design framework for the public spaces of the entire district. 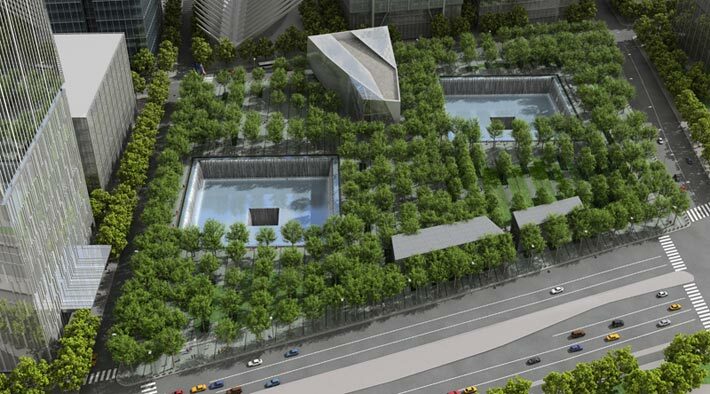 Detailed elevations set the levels of all future streets and sidewalks, building lobbies, and the Memorial. Existing and proposed underground utilities and infrastructure, such as the existing subway box, were analyzed and negotiated to create a final surface design. 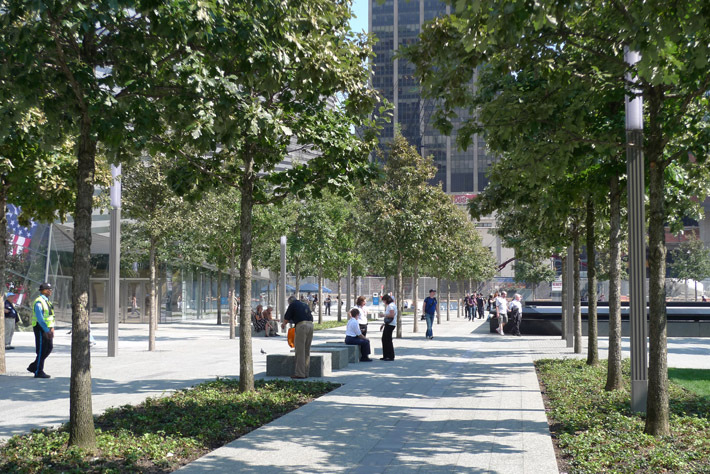 An important example of this rebuilding effort is PWP's development of a complete design for Cortlandt Way as an important pedestrian connection aligned with the Memorial. 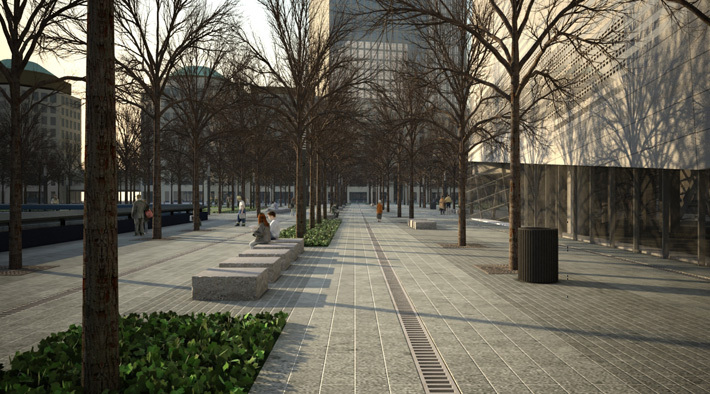 Now under construction, Cortlandt Way, is built with finely detailed stone pavements, stone seat walls, and retail and dining terraces to serve the needs of office workers and visitors to the Memorial; the significant grade change leading down to the Memorial was designed to amplify the view through the trees and into the South void. 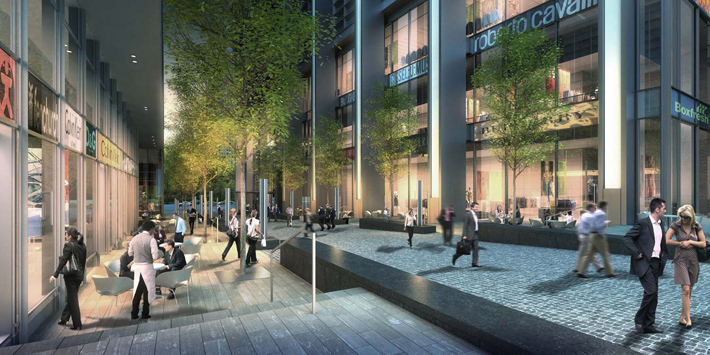 Construction will be in phases related to the completion of towers 3 and 4. 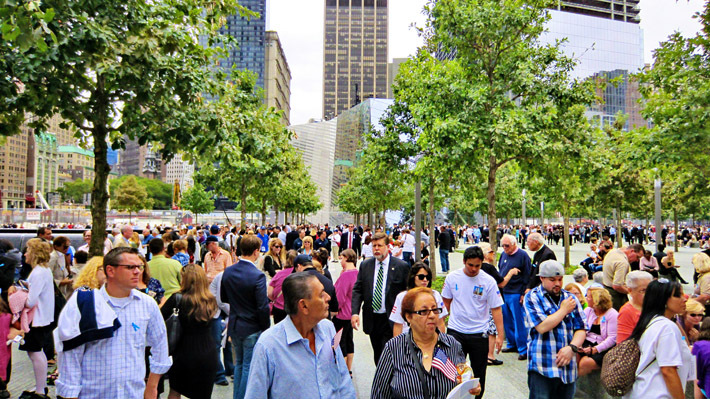 The first phase of the National 9/11 Memorial was dedicated on September 11. 2011. 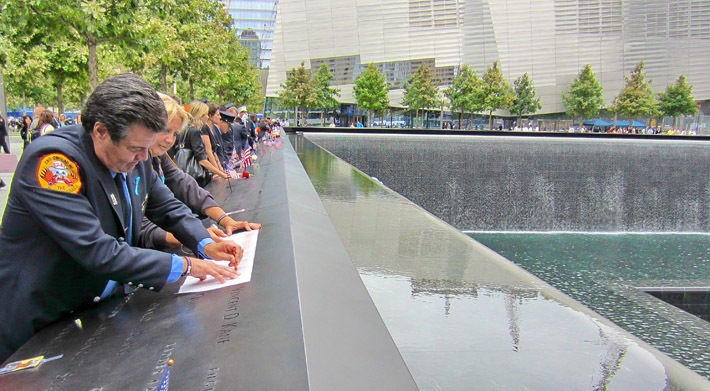 The Memorial opened to the public on September 12, 2011 on a reservations only basis. Construction continues on the remaining work. 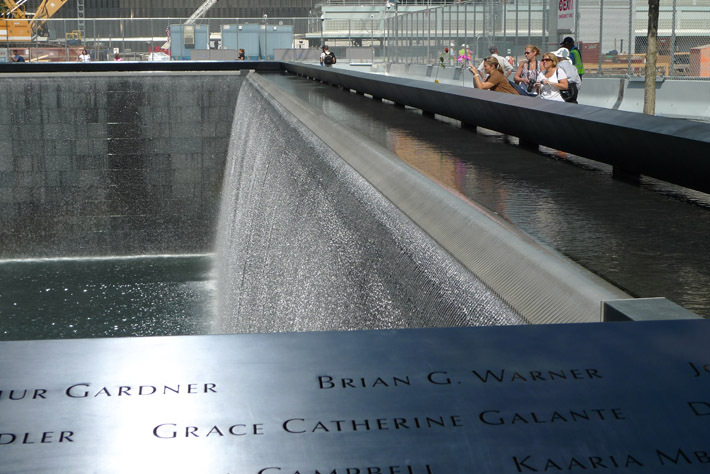 Through regular site visits and meetings with the contractor and our collaborators, PWP continues to advocate for a Memorial that will endure through the ages. 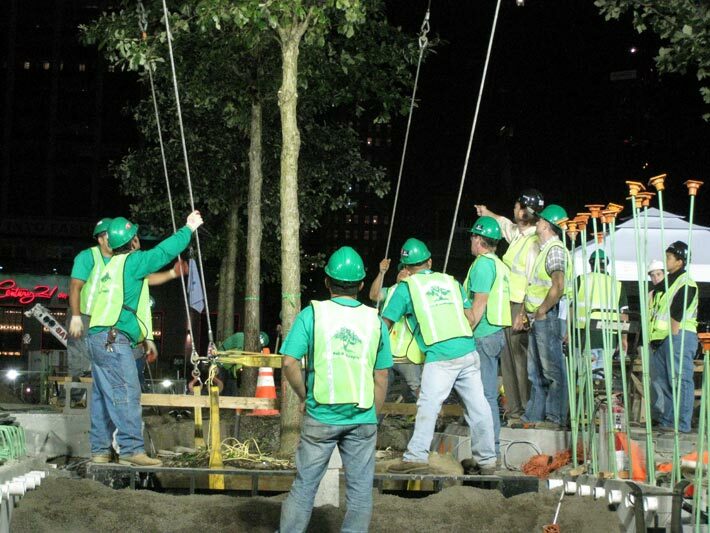 The trees were craned into place by Kelco Landscaping after the surrounding plaza was constructed and prepared for them. Pavers were hand set using a sand-set paving method. Like European streets, the pavers can be lifted out and re-used whenever repairs are required. 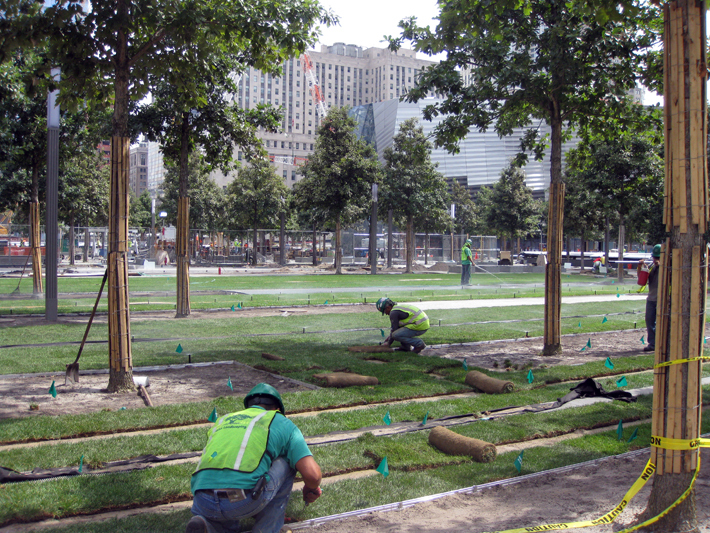 Sod was rolled out over an engineered (compaction-resistant) soil mix for the lawn areas within the Memorial Glade. In the days leading up to the Phase One opening, workers rushed to finish the plaza. 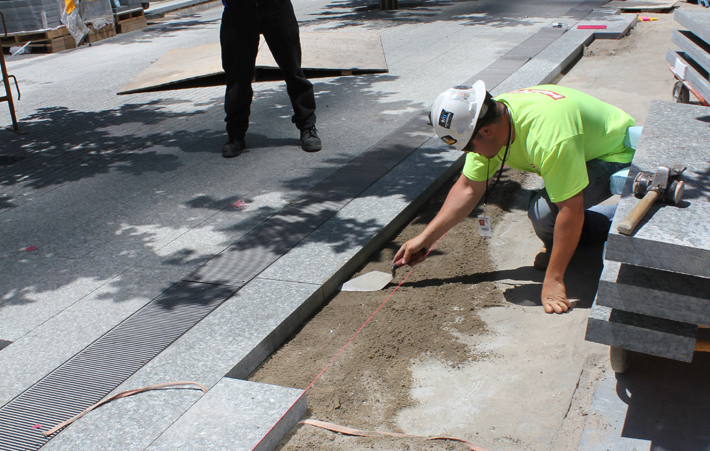 All adjustments and repairs were finalized, and the plaza was given a final cleaning in time for the opening.